Released between Between the Buttons and Beggars Banquet, the Rolling Stones’ 1967 foray into psychedelia has often been heard as a divisive outlier. Recorded in sessions spread throughout a tumultuous year, and often relegated to also-ran status as a me-too derivation of the Beatles’ Sgt. Pepper’s Lonely Hearts Club Band, the album hadn’t the conceptual grandiosity to create such a stir. Worse, the band’s own indifference, exemplified by quotes printed inside this lavish four-panel album-sized package, hasn’t redeemed the album’s image. But on this fiftieth anniversary, one can ask whether the album has been fairly assessed, and see if hindsight illuminates the work more clearly than the flashing, multicolored light shows of 1967. First and foremost, Satanic Majesties was a clear break from the tough, R&B-driven music on which the Stones had minted their reputation. The overt use of mellotron, oscillators and studio manipulations gives this album textures unlike any of the band’s other releases. And while drugs certainly influence other Stones recordings, none are so entrenched in psychedelia as this album. 1967 was a year of band turmoil, with Mick and Keith having been arrested on drug charges in February, Brian Jones’ girlfriend leaving him for Richards in March, Jones being arrested on drug charges in May, and the band’s manager, Andrew Loog Oldham, leaving the fold. And it was at an intersection of personal tribulation and acid-drenched communal ethos that the Stones recorded this album. The sessions were chaotic and weighed-down by hangers-on, and with Oldham abandoning ship, the band was left to produce themselves. The results were uneven – with jeweled classics rubbing elbows with uneventful jams. The album’s release on December 8 was foreshadowed by the single “In Another Land,” written and sung by bassist Bill Wyman. The tremelo-processed vocal, harpsichord, mellotron and dream-within-a-dream lyrics fit the album’s mood. With the A-side credited to Wyman (and with the B-side, “The Lantern,” credited to the Stones), the single scraped into the Top 100, leaving the album to generate its own publicity. The LP performed well commercially, reaching #2 on the U.S. chart with the help of a late December single of “She’s a Rainbow” backed by “2000 Light Years From Home.” Critics were mixed, and though the album earned a gold record in America, it seems to have been largely forgotten by the Stones the moment it was released. The studio recording of “2000 Light Years From Home” was used to introduce the group’s 1972 stage show, but it wasn’t until 1989 that they performed it live, and it was another eight years before they performed “She’s a Rainbow.” The rest of the material remained at rest on record, and the group’s return to rock ‘n’ roll with 1968’s “Jumpin’ Jack Flash” and the rock, blues and country of Beggars Banquet, rendered Satanic Majesties an anomaly. The indulgence that closes side one is redeemed by the perfection that opens side two. Introduced by a carnival barker, Nicky Hopkins’ music-box piano and John Paul Jones’ string arrangement key the brilliant and beautiful “She’s a Rainbow,” with bass and acoustic rhythm guitar reigniting the song each time it slows. The group’s blues roots shine through “The Lantern,” particularly in the blistering electric guitar riffs, but the tablas and flute jam of “Gomper” hasn’t aged well. The latter pales in particular comparison to the inspiration of “2000 Light Years From Home.” It’s this latter track, with discordant piano, mellotron, theremin, dulcimer, oscillator flourishes and a lyric of growing physical and emotional distance that will haunt your memory long after the record’s finished playing. The music hall closer, “On With the Show,” seems to both mimic the frame of Sgt. Pepper’s and anticipate that of Magical Mystery Tour, and provides an entertaining coda to the album. 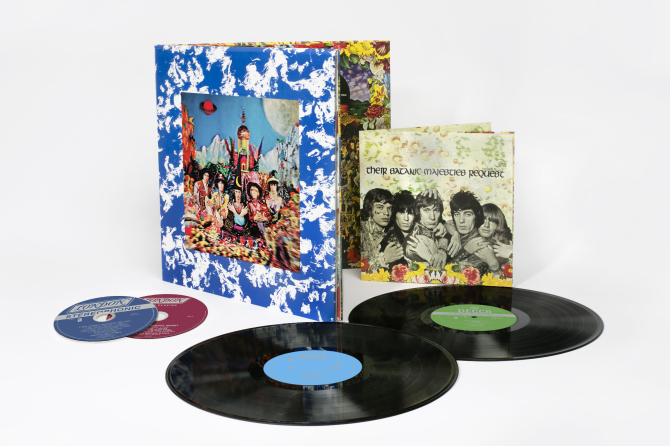 The album’s psychedelic underpinnings glow on many tracks, including the band’s preceding hit, “Ruby Tuesday,” and singles recorded during the Satanic Majesties sessions, “We Love You” and “Dandelion.” Unfortunately, these period tracks aren’t included as bonuses – nor are the outtakes and demos that have been bootlegged elsewhere. But what’s here was freshly remastered by Bob Ludwig at Gateway Mastering (2016-mono, 2017-stereo), and pressed onto both vinyl (from a lacquer cut by Sean Magee at Abbey Road) and hybrid SACDs. The two vinyl LPs and two SACDs are housed in a heavyweight, four-panel fold-out cover, with the album’s original lenticular art restored to the front cover and the gatefold art to the inside. A 20-page booklet includes an essay by Rob Bowman, and candid photos from Michael Cooper’s original cover shoot photo session. The package is hand numbered, and the pressing is advertised as a limited edition. So what’s actually new here? The mono master is the same as was used for the 2016 box set (vinyl and CD), but it’s reproduced here with a new vinyl lacquer, and as a first-ever high resolution mono release on the hybrid SACD. The stereo remaster is new, as is its vinyl lacquer. The lenticular cover art isn’t new, but has been out of circulation for many years. John Lennon may have ended up with the larger avant-garde cred, but this fascinating 153-minute documentary suggests it was Paul McCartney who first dug into the underground. 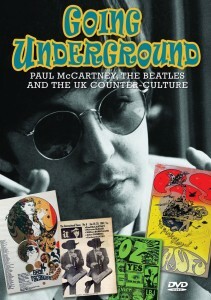 Combining period footage (including clips of the Beatles, Allen Ginsburg, Jack Kerouac, Pink Floyd and Soft Machine) and contemporary interviews with a number of ’60s scene-makers, the film demonstrates McCartney’s early interest and sponsorship of counterculture art and social activities, and the role he served in bridging the avant-garde into the mainstream. Beatles fans will recognize key moments in the group’s career, but may not know the roots of the invention and synthesis that brought “Tomorrow Never Knows” and other icons to fruition. Even lesser known is the role McCartney played in supporting key counterculture activities, such as Indica Books and Gallery, the Long Hair Times (and its successor the International Times), and the legendary Million Volt Light and Sound Rave. The story begins with the late-50s emergence of youth culture in the UK, including the Campaign for Nuclear Disarmament, the expressive freedom and bohemian romance of the Beats, the cutting edge jazz of the 1960s, and the growing influence of art school on music. The program gets to the Beatles at the thirty-minute mark, when John Lennon and George Harrison dip their toe in the underground at a birthday party for Allen Ginsburg. Lennon was then living in the suburbs with his first wife and child, and didn’t find an immediate resonance with the underground. McCartney, on the other hand, was a bachelor, living in London and being introduced to the works of John Cage by the family of Jane Asher, to Karlheinz Stockhausen and the BBC Radiophonic Workshop by George Martin, and to avant-garde books and art through his association with Indica. McCartney’s intellectual pursuits, and his experiments in a home studio (something that would continue into his post-Beatles solo career) were absorbed by the Beatles, but reiterated to the market in pop song format. The reframing of avant-garde ideas, coupled with the Beatles unprecedented renown, made it seem as if these concepts were drawn from thin air. But as this film documents, there are many antecedents from which McCartney and the Beatles drew, brilliantly recontextualized and then released into the commercial mainstream. This might seem opportunistic, had the Beatles not completed the loop by feeding back into the underground. By the end of 1966 the Beatles had abandoned touring, Lennon had met Yoko Ono (at a private showing of her work at Indica), and McCartney provided the impetus for both TNK and the “Carnival of Light” sound collage. The Beatles continued to slip avant-garde elements into their music, but 1967 turned out to be a year of changes. McCartney’s media appearances gave a more explicit view of his involvement with the underground, but by year’s end, with the death of Brian Epstein, he’d given himself over to running the group’s business. Lennon, on the other hand, had become much more deeply enmeshed with the avant-garde, and expanded its role on Beatles records with Revolution 9. Post-Beatles, Lennon strengthened his ties to political elements of the underground, but the avant-garde influences faded from his solo music. McCartney doubled-down on the mainstream with Wings, but continued to experiment in his solo outings.